New Harbinger Publications, 9781626252660, 224pp. Modern times are stressful--and it's killing us. Unfortunately, we can't avoid the things that stress us out, but we can change how we respond to them. In this breakthrough book, a clinical psychologist and neuroscience expert offers an original approach to help readers harness the power of positive emotions and overcome stress for good. Stress is, unfortunately, a natural part of life--especially in our busy and hectic modern times. But you don't have to let it get in the way of your health and happiness. Studies show that the key to coping with stress is simpler than you think--it's all about how you respond to the situations and things that stress you out or threaten to overwhelm you. The Stress-Proof Brain offers powerful, comprehensive tools based in mindfulness, neuroscience, and positive psychology to help you put a stop to unhealthy responses to stress--such as avoidance, tunnel vision, negative thinking, self-criticism, fixed mindset, and fear. Instead, you'll discover unique exercises that provide a recipe for resilience, empowering you to master your emotional responses, overcome negative thinking, and create a more tolerant, stress-proof brain. 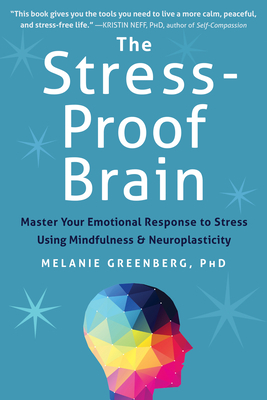 Melanie Greenberg, PhD, is a practicing psychologist and executive coach in Marin County, CA, and an expert on managing stress, health, and relationships using proven techniques from neuroscience, mindfulness, and cognitive behavioral therapy (CBT). With more than twenty years of experience as a professor, writer, researcher, clinician, and coach, Greenberg has delivered workshops and talks to national and international audiences. She writes the Mindful Self-Express blog for Psychology Today, and is a popular media expert who has been quoted on cnn.com, forbes.com, BBC Radio, ABC News, Yahoo! Shine, and Lifehacker, as well as in Self, Redbook, Men's Health, Women's Health, Fitness Magazine, Women's Day, Cosmopolitan, and The Huffington Post. She has also appeared on radio shows like Leading With Emotional Intelligence, The Best People We Know, Inner Healers, and Winning Life Through Pain. Greenberg was named one of the 30 Most Prominent Psychologists to Follow on Twitter.